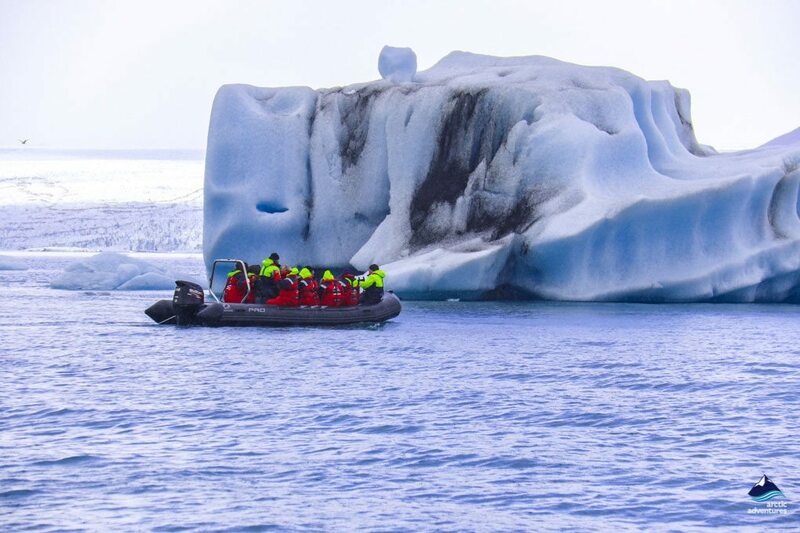 Arctic Adventures offers glacier explorations of various length and difficulty. We offer Glacier hiking, Ice climbing and Ice cave excursions from three locations in Iceland; Skaftafell, Sólheimajökull and Reykjavik. Whether you are an experienced glacier guru or a novice you are sure to find a trip that suits you. Iceland is often nicknamed the land of Ice and Fire due to the fact that glacier and volcanoes cover a large part of it. In Iceland, these two sometimes mix and some glaciers even have a hidden volcano underneath it, for example, Eyjafjallajökull and Snæfellsjökull glaciers, this is called a stratovolcano and these phenomena can have a great impact on the surrounding land when erupting. The main glaciers of Iceland are Snæfellsjökull, Drangajökull, Eiríksjökull, Langjökull, Hofsjökull, Tungnafellsjökull, Vatnajökull, Mýralsjökull and Eyjafjallajökull, from these glaciers run outlet glaciers, some even pretty famous, like Breiðarmerkurjökull (home to the Crystal Ice Cave) and Sólheimajökull. Most of the glaciers are located in the South or in the Midlands because more snow falls there than manages to melt away. This occurs when moist winds heading over the North Atlantic give a rise to the air over Iceland, the air gets colder and the moistness gets thicker which then turns into drops which then become crystals that fall down, they will turn into snow if it is cold enough. When the winds reach North most of the moist is already out which results in less precipitation. About 20% of precipitation falls over glaciers. The glaciers cover about 11% of Iceland’s area or about 11.400 km2 of 103.125 km2. 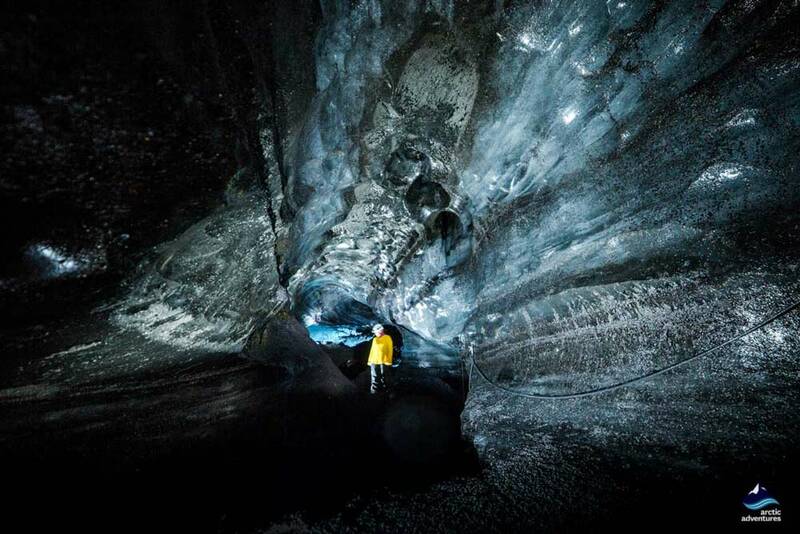 Vatnajökull, Iceland’s largest glacier covers about 8% off the land. It is believed that the last ice age came to an end about 10.000 years ago and from that time came a warm period in time. Iceland is thought to have been completely glacier-less (or at least almost) about 9.000 years ago. This lasted up until about 2.500 years ago but the weather is believed to have been very mild at this point. Then at this time, about 2.500 years ago Iceland go colder again and the glaciers that we see the present times started to form, reaching an all-time peak about 1900 AC. Around the year 1995 glaciers started shrinking rapidly and now makeup about 20% of Icelandic rivers and waterfalls. 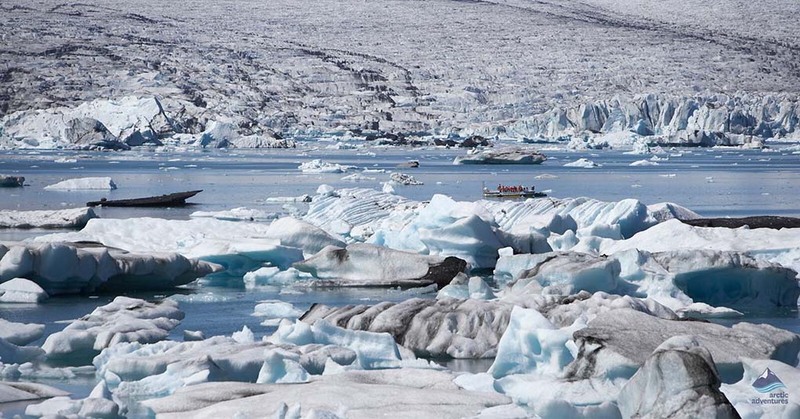 Vatnajökull glacier has been shrinking at an alarming rate and predictions are that the glaciers in Iceland will only continue to melt creating even more streams and carving their way around Iceland. This has also been thought to affect the rise of the sea level as the melting glacier water will, in the end, join the sea waters. Volcanoes and their eruptions can also affect the melting of the glaciers, something that was very evident when Eyjafjallajökull stratovolcano erupted in 2010. The glacier shrunk considerably and its rivers and waterfalls gained flow. Vatnajökull is by far the largest glacier in Iceland, it is even the largest glacier in Europe. 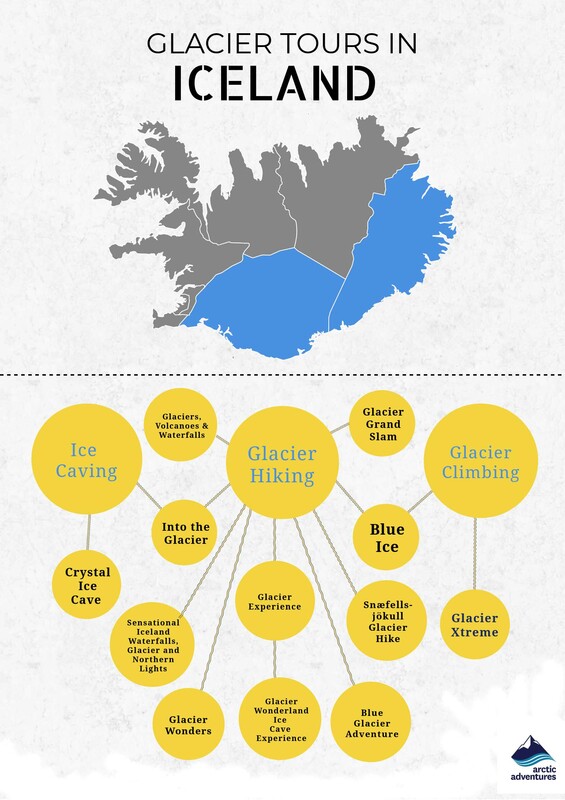 Here is a list of the biggest glaciers in Iceland listed by size from biggest to smallest. The King of Icelandic glaciers! Vatnajökull is the largest glacier in Europe with about 8100 km² (3127 square miles) and its total ice volume is around 4000 km3. The glacier is about 400 meters thick on average but at the most about 950 meters. Underneath the glacier you will find valleys, gorges and mountains some of them rising about 2000 meters. Vatnajökull is mostly about 1400-1800 meters above sea level but these numbers all change quickly as the glacier is shrinking rapidly. Between the years 1992-2001 studies done by the University of Iceland showed that the glacier shrunk about 6 km³ which is about 0,15% of the total glacier. The water that runs from Vatnajökull is tremendous and believed to be around 5000 m³ per second. No glacier in Iceland has been researched as greatly as Vatnajökull but studies on the glacier started in 1934 when a volcanic eruption took place in Grímsvötn. The first person recorded to travel across the glacier was Englishman W.L. Watts but he traveled alongside five Icelanders in the year 1875 and they were the first to come across the eruption of Askja and could report it to the farms around. 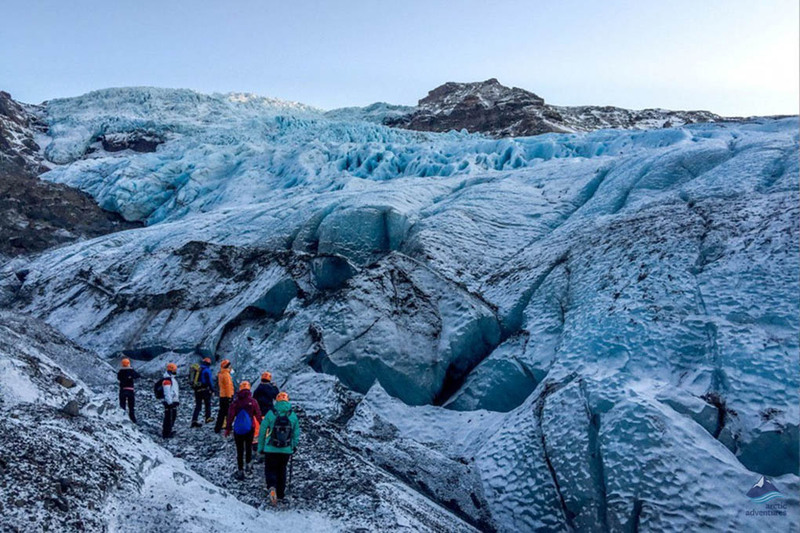 Today glacier hiking trips, hikes to Iceland’s highest summer, Hvannadalshnúkur and snowmobiling tours are available on Vatnajökull glacier and on its many outlet glaciers. The outlet glaciers from Vatnajökull are many: Falljökull, Breiðamerkurjökull, Brúarjökull, Dyngjujökull, Skaftárjökull, Köldukvíslarjökull, Tungnárjökull, Síðujökull, Skeiðarárjökull, Svínafellsjökull, Skálafellsjökull, Fláajökull and Eyjabakkajökull. It is home to the highest peak in Iceland Hvanndalshnúkur 2,200 meters tall or 7,218 feet. Vatnajökull covers some of Iceland’s most active volcanoes including Bárðabunga, Öræfajökull and Grímsvötn. Vatnajökull National Park was founded in 2008 and has been growing in size since. Today it is the second largest National Park in Europe. Breiðarmerkurjökull, Vatnajökull’s outlet glacier is the “mother” to Jökulsárlón Glacier Lagoon one of Iceland’s most visited locations. 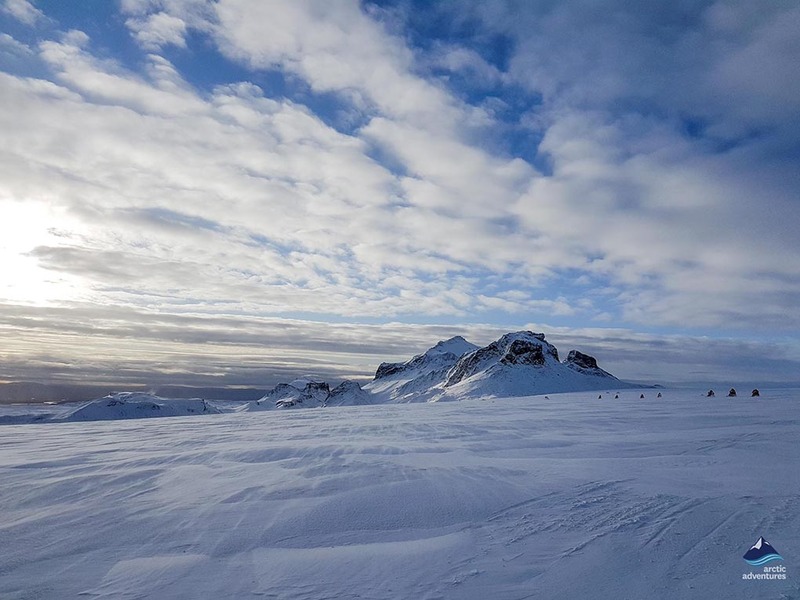 Vatnajökull has been used as a filming location for some Hollywood films including James Bond: A View to Kill (1985) and again for James Bond: Die Another Day, it was also used to film Batman Begins and Lara Croft: Tomb Raider. Vatnajökull has also been a filming location for the famous TV series Game of Thrones. Mýrdalsjökul is the fourth largest glacier in Iceland and the ice cap that Sólheimajökull runs from. 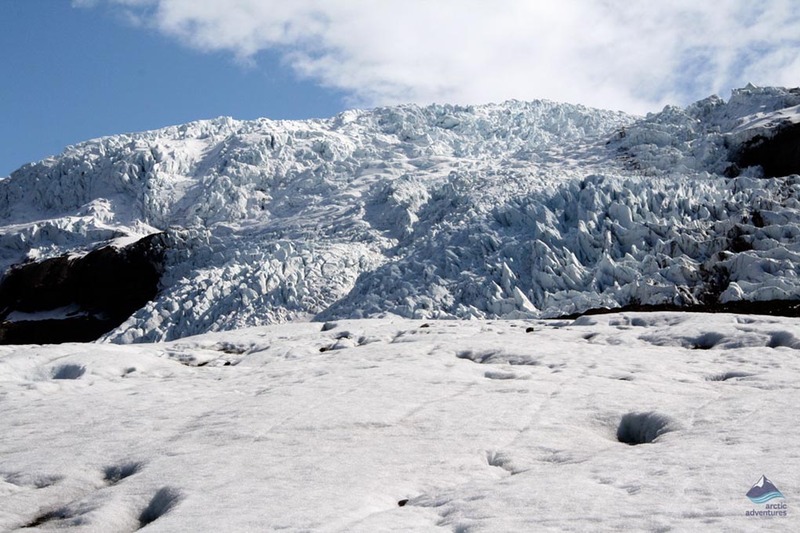 The glacier rests on a very active volcanic area which includes the voluminous Katla volcano. Katla is believed to have been a huge stratovolcano that declined and formed a caldera. This caldera measures about 10 km across and volcanic eruption can take place at a few places within the caldera. Mýrdalsjökull is located right next to the Eyjafjallajökull glacier and between the two lies the hiking trail Fimmvörðuháls. Close to it is the valley of Thor, Thorsmork which is recognized as one of the best hiking areas in Iceland. A few rivers run from the Mýrdalsjökull including Markarfljót that beautifully runs through Thorsmork valley, Múlakvísl rivers, Hólmsá river and Jökulsá river at Sólheimasandur. The outlet glaciers from Mýrdalsjökull include Sólheimajökull, Kötlujökull (home to the Ice Cave Under the Volcano) and Höfðabrekkujökull. Home of the Sun Glacier – a glacier hiking paradise right off the Ring Road in South Iceland. It is about 8 km long and about 1-2 km wide. 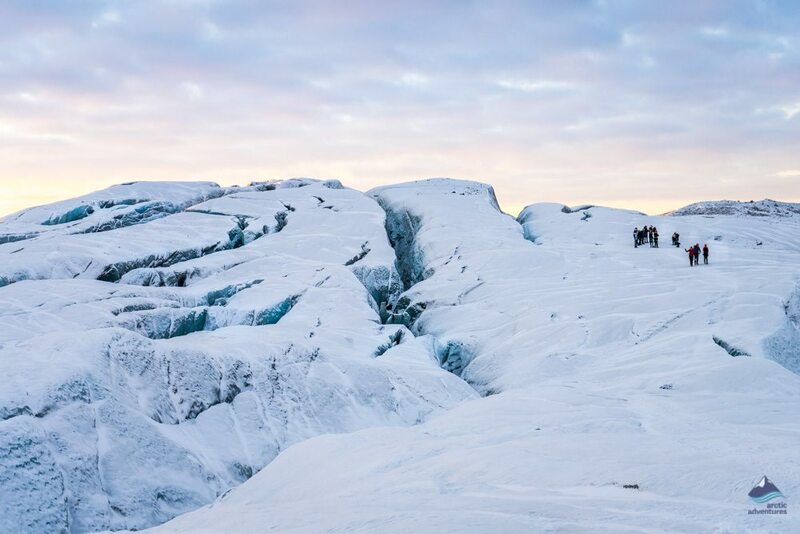 This stunner is one of the most visited glaciers in Iceland and is located only about 2-2,5 hours from Reykjavík. The glacier has in recent years gotten the nickname “the shrinking glacier” as the evidence are quite clear. The glacier has been shrinking about 65 meters every year over the past couple of decades and some believe that soon it will not be here. The White House even used photos of Sólheimajökull to highlight the need to take action in regards to Climate Change. We must enjoy the beauty while it lasts and do anything we can to try to help preserve it! 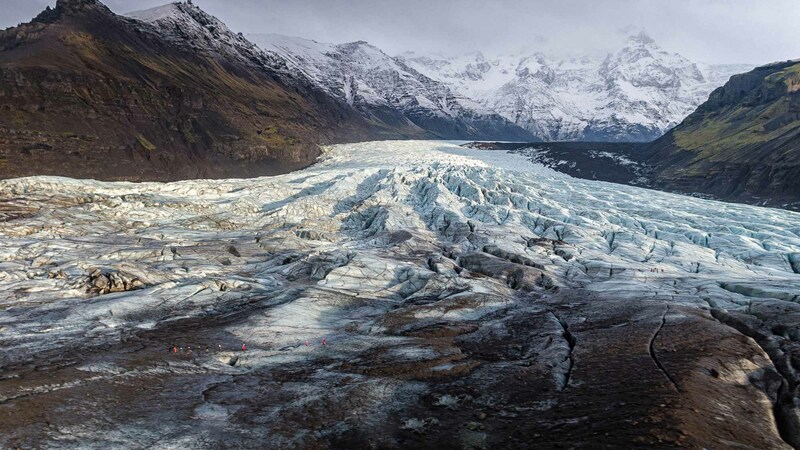 Sólheimajökull is known to be an extremely beautiful glacier, with its turquoise blue ice and its stunning vistas. 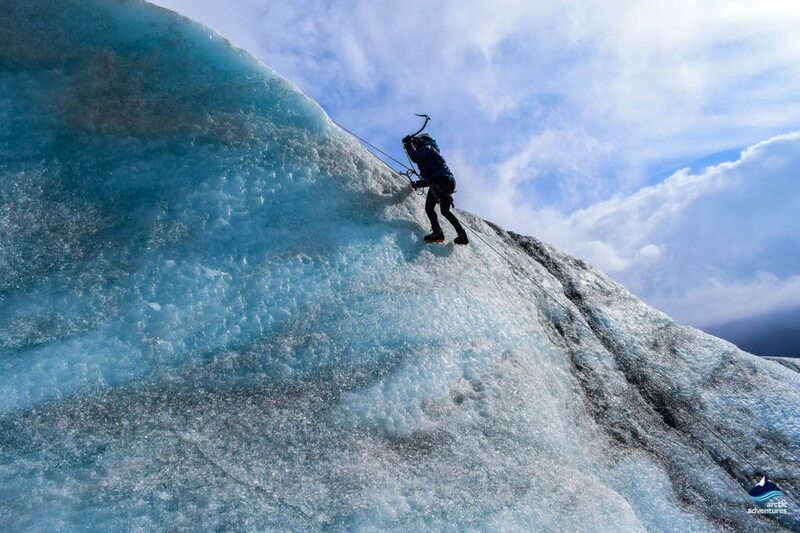 One of the most popular tours Arctic Adventure offers, Blue Ice – Glacier Hiking and Climbing takes place on Sólheimajökull and it is truly one of our favorites! Eyjafjallajökull got famous in 2010 when it suddenly started to erupt. Yes, in Iceland a glacier can erupt! The eruption stopped almost all air traffic for quite some time and caused a lot of chaos but surprisingly affected Iceland less as the smoke rose high into the sky and only the closeby farms saw some serious repercussions. Still, the ash traveled wide and far within the island and some life stock nearby did not make it. The glacier is a stratovolcano which means that underneath the ice cap you will find a volcano. Eyjafjallajökull sits in the Eyjafjöll mountains and is therefore called Eyjafjallajökull which actually means Island-Mountains-Glacier and has to do with the fact that surrounding the mountains were once islands as rivers and oceans ran around before drying out and land rose to the appearance you see today. The area around called Landeyjar for the same reason e. Land-Islands. 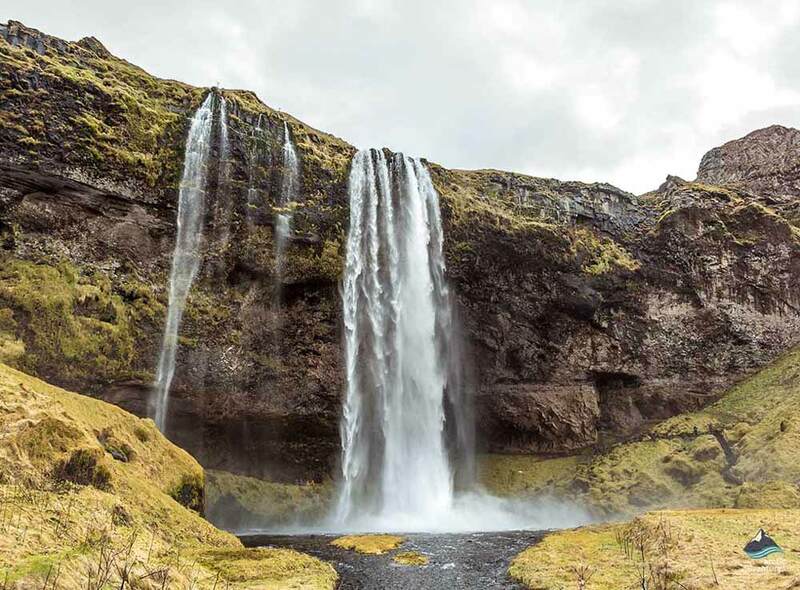 Eyjafjallajökull feeds the enchanting Seljalandsfoss waterfall “the one you can walk behind” and can easily be seen from the Ring Road 1 when driving around the South Coast. 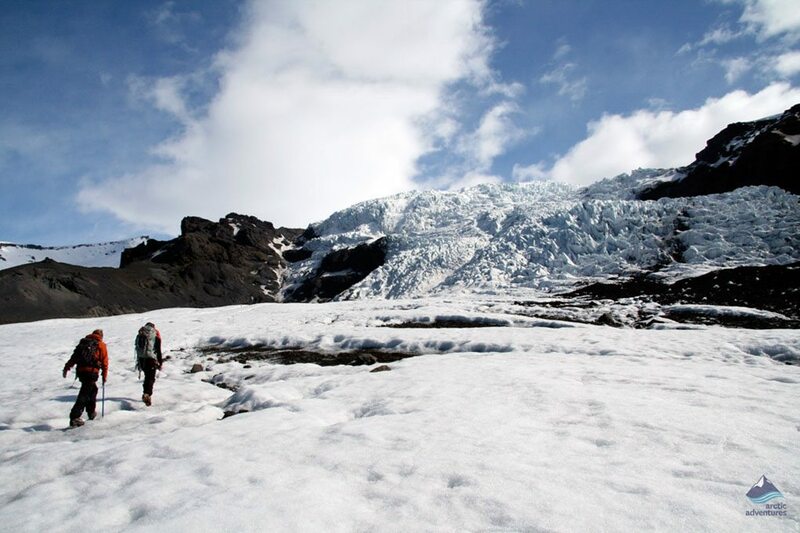 It is one of the glaciers you walk past on the Fimmvörðuháls trail and one of the glaciers that frame in the Thorsmork valley. Snæfellsjökull glacier is the only glacier found on the Snæfellsnes peninsula and was very likely the first glacier in Iceland to become famous. The French novelist, poet, and playwright wrote about the glacier in his book “Journey to the Center of the Earth” as the gate to the Earth’s core and still today many like to visit the ice cape solely for this reason. This epic enchanter is a real token on the else lava covered peninsula and can be seen from afar, even Reykjavík on clear days. Snæfellsjökull is known to be one of the most picturesque glaciers in Iceland and the fact that it is also a stratovolcano (glacier on top of a volcano) makes it even more magical. 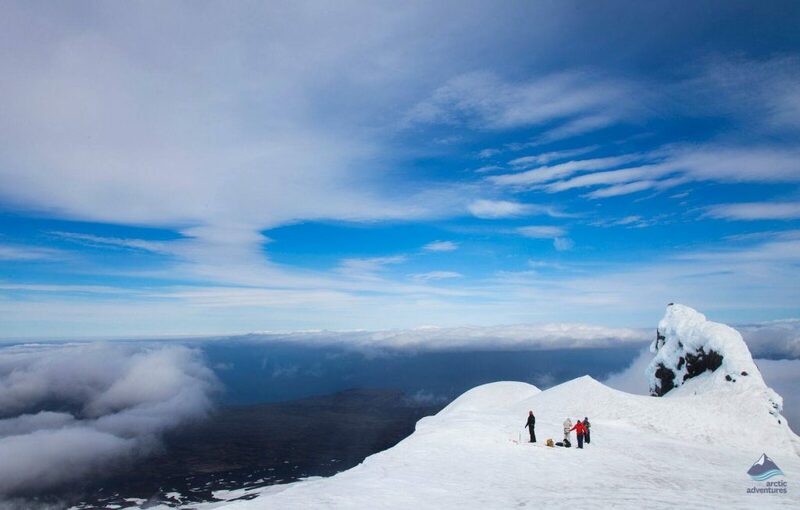 Snæfellsjökull summit is a very popular day hike to make and Arctic Adventures offers tours to the top during Summer time which no hiker should let pass. Snæfellsjökull has been chosen as the most scenic destinations in Europe and the view from the top will tell you why! The second largest glacier in Iceland, it is located in the West of Iceland in the highlands and can be seen from Haukadalur region home to Gullfoss and Geysir. Langjökull glacier is the water source of Gullfoss, Hraunfossar and Barnafoss waterfall. It is also the source of water for Europe’s most powerful hot spring, Deildartunguhver, found in Borgarfjörður valley. Langjökull is easily accessible from the Gullfoss parking lot although you will need to drive an F-road to get there. The glacier is about 9532 and its volume is 195km2. The vista around Langjökull glacier has often been described as some of the most moon-like landscapes found in Iceland. This was one of the reasons the movie Interstellar was filmed there where Tom Cruise is seen sitting on Jarlhettur mountains overlooking the glistening icecap. 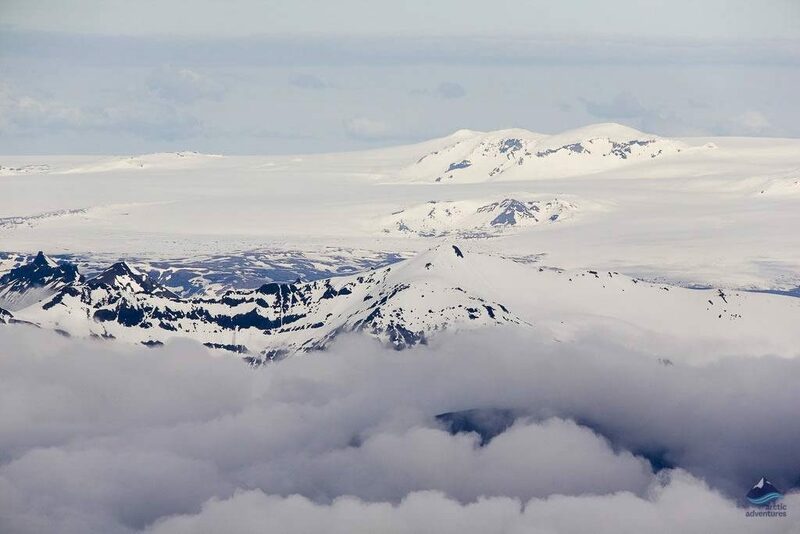 Under Langjökull there are two volcanic systems and the calderas can be seen from air. 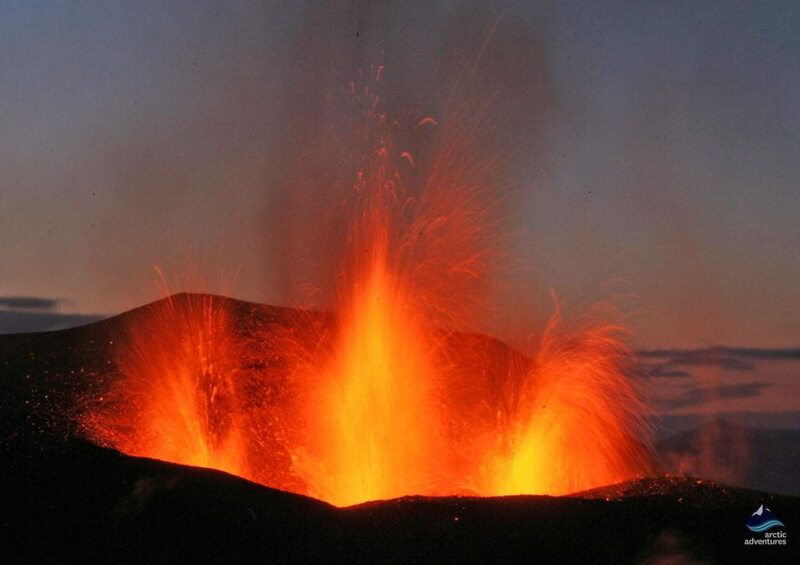 The best known volcanic system of these is Hveravellir e. Hot spring fields which are, like the name tells, a place of great geothermal heat and high temperatures. Most of the glaciers in Iceland can be seen right off the Ring Road. They are mainly located on the South Coast in Iceland and in clear weather, you can see them from afar. If you are staying in Reykjavík the closest glacier to you is Mýrdalsjökull’s outlet Sólheimajökull. It can be seen from the main road 1 in good condition but otherwise, you can join a glacier hike to explore. If you are on the Snæfellsnes peninsula you will easily spot the beautiful Snæfellsjökull that thrones the lava covered area. You will need to drive for about 1,5 hours from Reykjavík before you start spotting the beaut. If you are driving further out to the South East glaciers will not go out of eyesight most part of the drive or travel. The South East is covered by glaciers and the largest ice cap is located there stretching its outlets down to the road. In the Westfjords you can find one glacier, the Drangajökull glacier. It is hard to reach this stunner but some hiking trails are in its area. 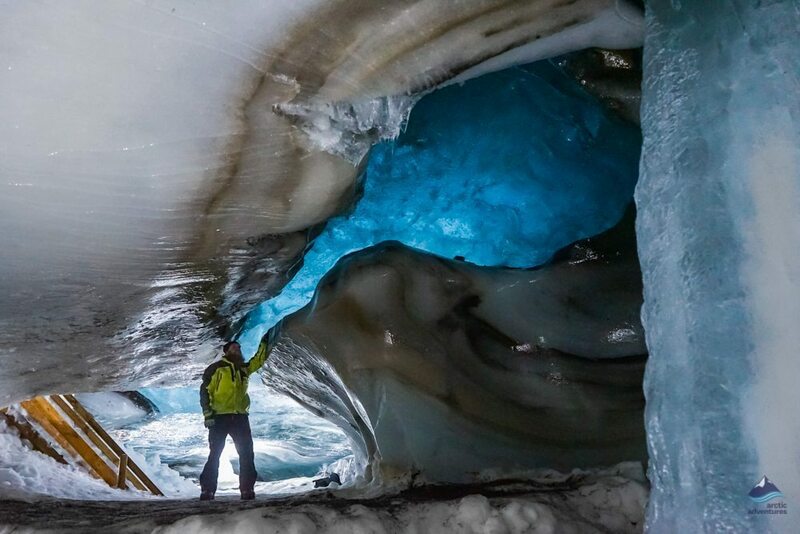 The glacier should never be visited without a guide. 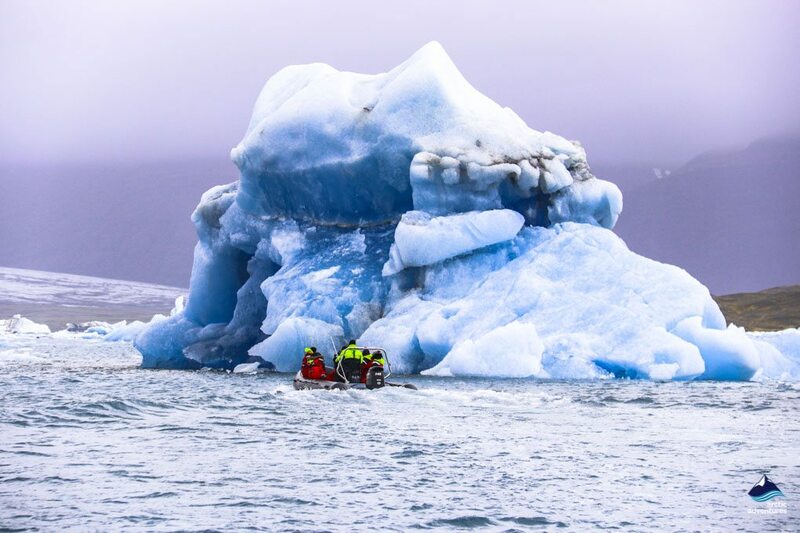 How to Choose the Right Glacier tour in Iceland? When making a bucket list for Iceland odds are that you wrote down “go on a glacier hike” and you were right to do so, the island is after all named after ice. But there is only one problem you might encounter; there are too many options when it comes to tours, but fear not, we are here to help! Are you joining a day tour or a multi-day tour? If you are joining a day tour, will you have a car? After that, you might want to consider the time you have in Iceland. If you are staying only a short amount of time, maybe on a stopover or simply prefer the Reykjavík city life then Langjökull, Sólheimajökull, Kötlujökull and Snæfellsjökull are the closest glaciers and can easily be visited on a day tours out from the city. 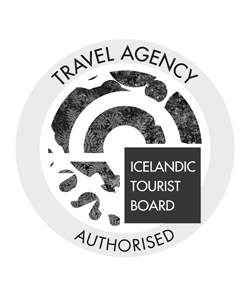 This gives you the options of Snowmobiling on Langjökull “the second largest glacier in Iceland” or even Snowmobiling and Ice Caving if you are visiting in Winter. For those who want to explore the South Coast as well: Glacier, Volcanoes, and Waterfalls. Then we have the magical Kötlujökull, an outlet from Mýrdalsjökull as his brother Sólheimajökull. 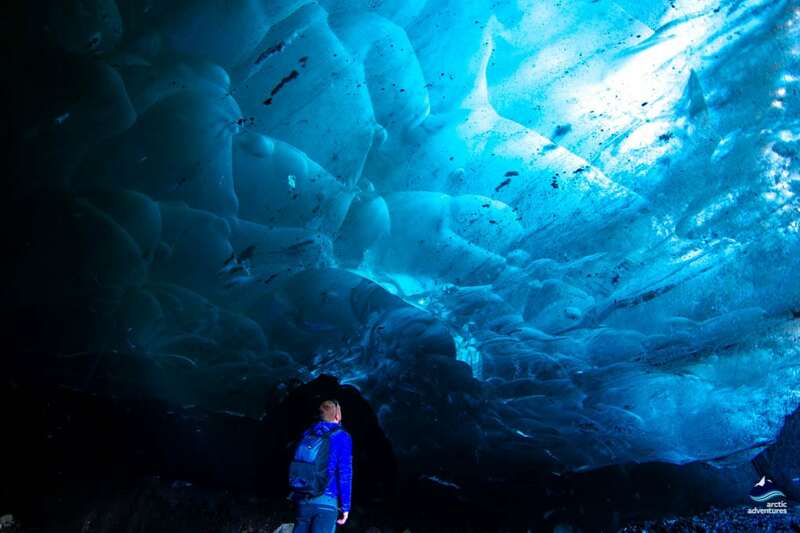 Here a natural ice cave was found not too long ago that lasts throughout the year. This was at the time completely new and had never been known to exist in Iceland. 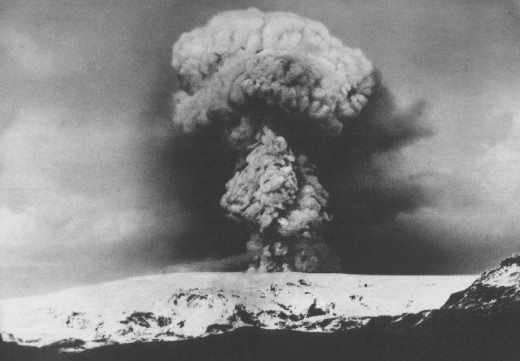 Kötlujökull is named after the volcano Katla as it sits under the glacier. This is why the tour has been named The Ice Cave under the Volcano. This tour is available from Vík and Reykjavík. 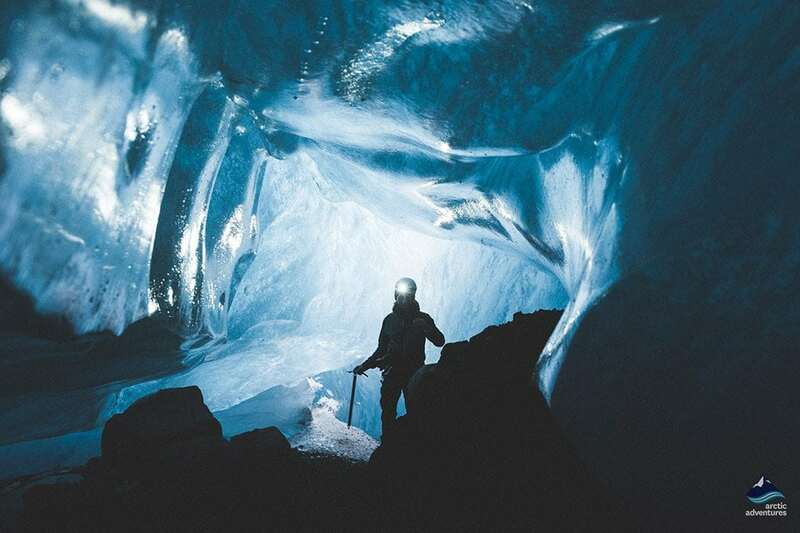 For winter traveling in the region, you could join a Crystal Ice Cave tour, the most popular ice caving tour year after year, you could do the glacier hiking and ice caving combo called Into the Glacier or join a shorter glacier hike, the Glacier Wonders (available all year). 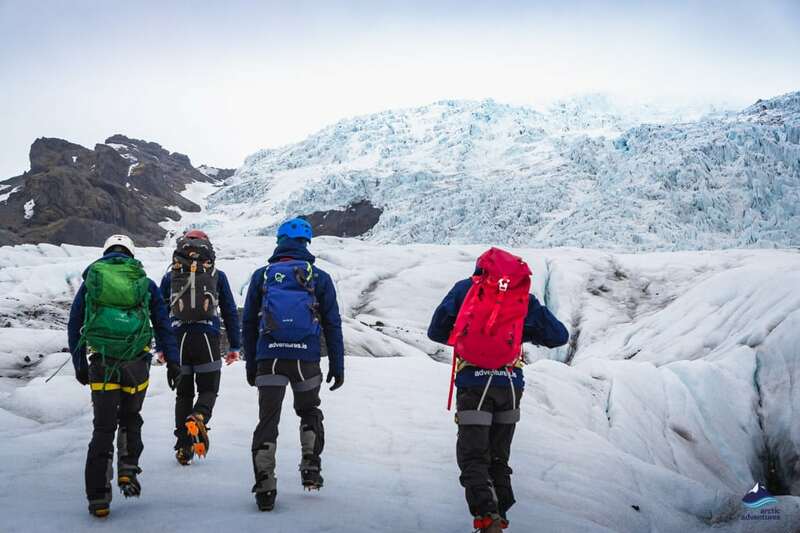 For those who want to go further up on the glacier can then join the Glacier Explorer (available all year) but if you are there in summer the Glacier Grand Slam and the Glacier Xtreme are ideal! 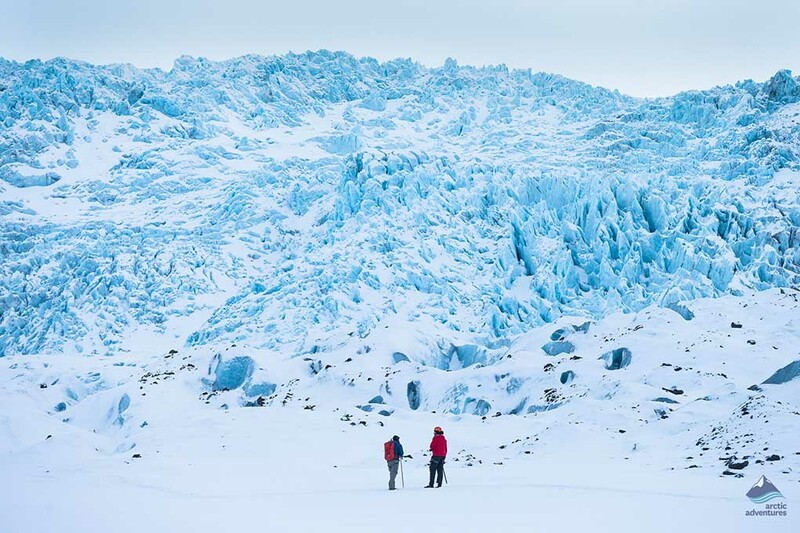 When exploring Glacier Hiking on Multi-Day Tours you have the many intriguing options, both with and without accommodation, with pick-up or including a rental car (a self-drive trip). 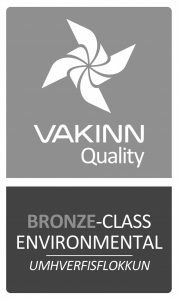 Do you want to stay in Reykjavík and do day trips out? 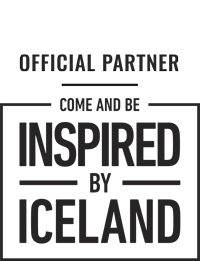 Do you want to join a guided tour? Do you want to do a guided self-drive trip? For those who want to stay the night in Reykjavík but join glacier hiking experiences as well as other fun activities on day trips can look at the Adventure Packages in Iceland options. Where you get 10% off each day trip. 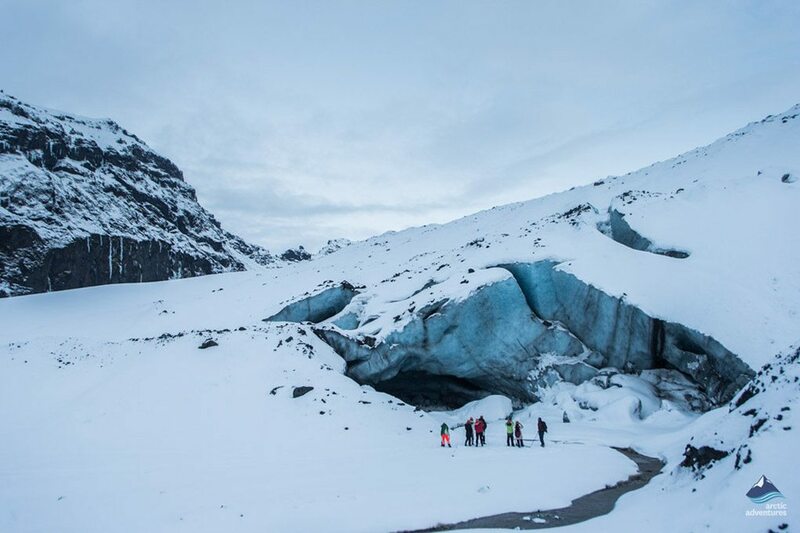 For those who want to join a guided tour with a glacier hiking experience which travels further out of the city exploring hidden gems and staying at farm hotels, they can look at the Multi Day Adventures in Iceland. 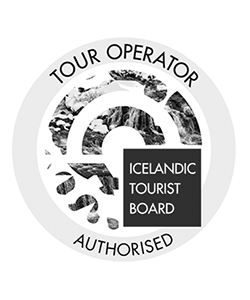 And for those who would like to do a glacier hike but have their own automobile on a self-drive tour then the Self-Drive Tours in Iceland are the best.